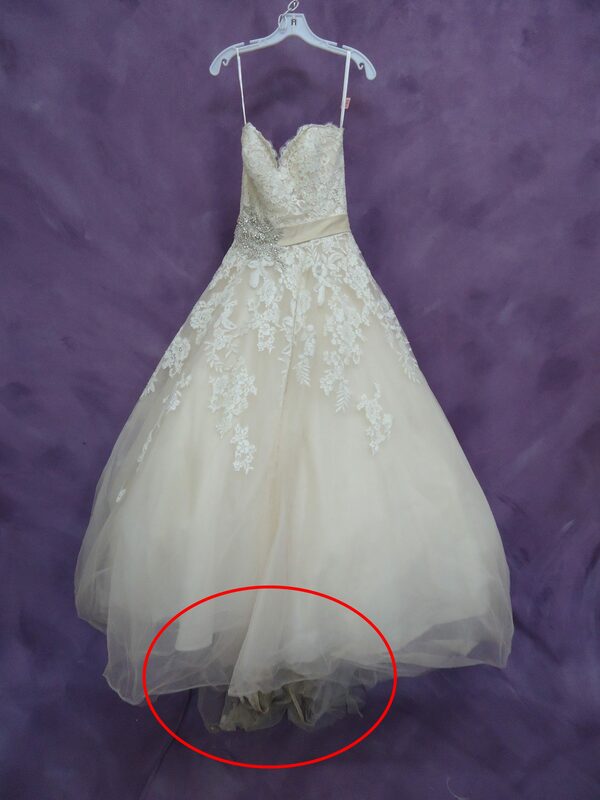 Most of the gowns featured in our “Before and After” blog series have something obviously wrong– it’s completely yellow, or there are noticeable tears in the fabric, or the bottom few inches all around the dress are covered in dirt; this dress, however, was more of a surprise. And not the kind a person likes, either. 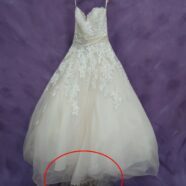 …What is that peeking out the bottom?! Yuck! 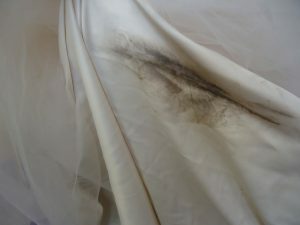 A gown might look great from one angle, but can actually be suffering from significant wear and tear. 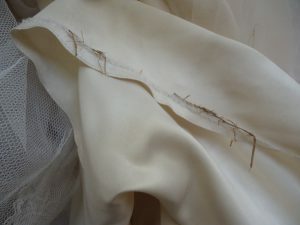 Left untended, the delicate fabric in this dress could have continued to be damaged and the hemline could’ve come completely undone. 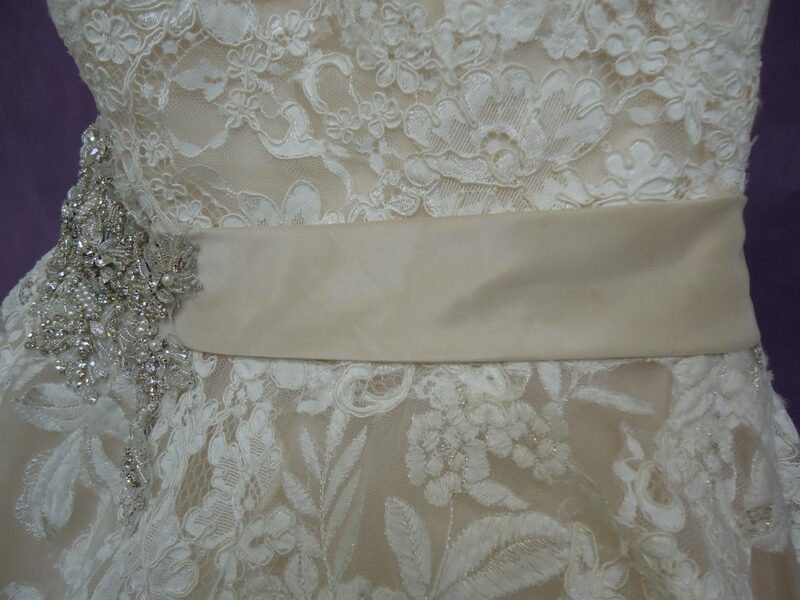 We hand-cleaned this delicate gown, tending to the dirty hemline, the tears and loose threads, and tidied up the rest of the dress as well. 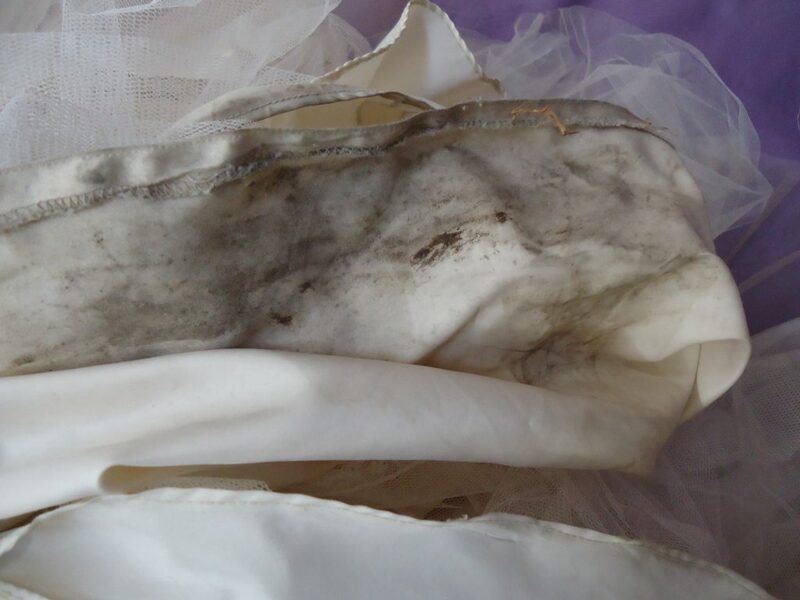 Because this customer decided to have her gown carefully cleaned and preserved using the Museum Method, we can guarantee she won’t face any more surprises– her lovely dress will stay looking great inside and out. 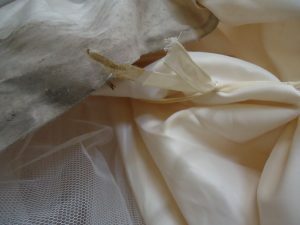 Well yes– We ask that you keep your preserved garment in a climate controlled environment (most indoor closets are fine.) Please avoid attics, basements, and garages for storage where temperature fluctuations or excessive dampness may occur. 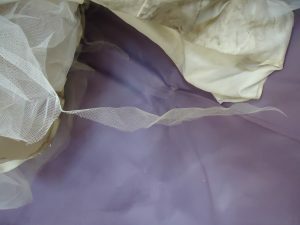 Always wear the cotton gloves that we include with our services any time that you handle your preserved garment. Your hands have natural oils on them that may not appear immediately, but can oxidize over time and develop into stains. Want to learn more about our preservation guarantee? Read about it here!